Facebook Live is a great way to convey your message to your social media followers. The best part is that it’s a free facility offered to companies, corporations and the common man alike. Needless to say, Facebook Live is an amazing way to generate leads when you’re running a business. In fact, it’s better than YouTube, because your video would automatically start streaming when someone even scrolls to it on their Facebook newsfeed. Since you’re live, you get live reactions and comments from your viewers, generating an insane amount of valuable consumer feedback on the spot. So how does one go about generating quality leads using Facebook Live? Since users can stream videos on the phone, it means you can convey your message to people even when they’re on the go. Moreover, they can share your video to their friends, creating an expanding circle of viewers. Basically, this is what leads are; contacting potential consumers of your brand. A lead could be hooked through a number of actions that generate from a comment, follow, like or share from a user. A quality lead is a user who has a large following. If you have the right strategy to use this powerful social media tool, you can instantly uplift your brand and skyrocket its visibility to your leads across the different regions. 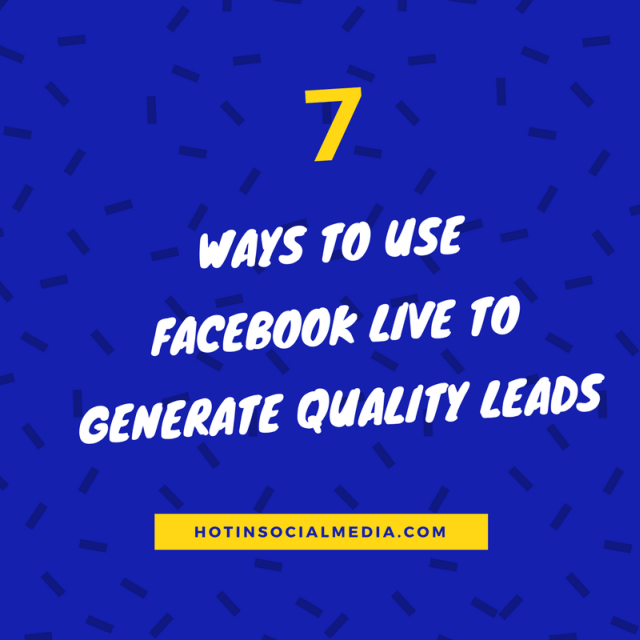 In order to get tips and use Facebook Live to generate quality leads, read on. Known as Facebook Advertising, this feature would give you the option of promoting your brand by throwing some deals. That is, if you have a certain number of followers already, the offer could be a discount whenever a potential customer signs up to your e-mailing list or a competition awarding a user that shares your content the most. Within your video, you can offer discount codes, information about the flash deal and other valuable information that would only be available to those followers who actually see your videos. This allows the consumers to actively and timely respond to your offers. If you put a contact form at the end of your video, then potential customers could very well fill it in without having to go anywhere else. This is the perfect chance to gather contact information, an incredibly valuable asset for the marketing part of your business. A Call to Action is a video clip that you can create, asking your audience a question, which includes them in your marketing strategy. Alternatively, this video can be used to start a relevant discussion about your brand, issue, or whatever you have to offer. This discussion could be started in the comments on the video itself and invite comments and likes on your posts. This would then turn into more viewer recognition for you and your brand. An amazing feature of Facebook Live is that it gives you ‘live feedback’ as well. You can be making a video of yourself in your room or at a social event, for example, a promotional event for your brand. In this way, you could reach even those potential customers who aren’t at the event. Additionally, you could instantly read what questions or comments the viewers have about you or your products. You could then engage with them directly, answering their questions and thanking them for their input. Not only does this lead to high consumer satisfaction, it also gives valuable information about your customers. You can then use this to make changes or otherwise act accordingly, leading to even more approval from your audience. Everyone loves to know that they have been heard and that the changes they want are being implemented. Your viewers could become your marketing team. If you urge your audience to share a live video, they would do so, provided they enjoyed it. Your campaign can then have a massive outreach. However, it is important to have a good video content as well as an influential following. Like the tabs of links, you can also have your followers redirected to your blog or website. Your Facebook page has tabs in the ‘Contact Us’, ‘Subscribe’ or ‘Sign up’ section. Creating these links would allow your followers an easier way to get viewers signing up to follow you. Facebook Live is a marketing opportunity not to be missed. It doesn’t matter whether you’re running a page uploading feminist videos, selling books, or teaching others how to make and sell jewelry, videos can come in handy for grabbing the attention of Facebook users. Don’t let his opportunity pass you by! Lauren Ebsary is a Social Media Marketer, Blogger, and Growth Hacker. She is an expert in social media marketing and has successfully run many campaigns in the past Like UK Essay writing firm. You can reach her via Google+, Twitter, and Facebook.